Large Particulate Valve - R-Cap Process Equipment, Inc. Using our standard leak-free Mix Proof valve as a baseline, our engineers developed a valve which allows particulates, up to 1 inch in the standard design, to travel down through the valve without lodging in the seat area. With the standard integral seat lift actuator, both seats can be cleaned during operation. 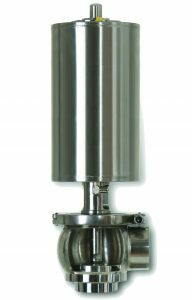 Using the Mix Proof valves in a cluster design allows the height of the mixing kettles to be lowered so that they are accessible from the ground. By replacing flow plates with Mix Proof valves, the customer improved product quality by eliminating atmospheric contamination. In conjunction with Pentair Südmo’s Bus-compatible IntelliTop™, the customer was able to integrate the valves into their control system with a simple cable and air supply.